ACV is a multipurpose ingredient and a potent chemical that can be used for a number of skin problems. Its anti-bacterial properties kill harmful bacteria in the skin, cleaning out pores and reducing blackheads. All you need is a few drops of apple cider vinegar and a cotton ball. Use the cotton ball to dab ACV on the affected area in your skin and let it dry. Raise your face using warm water after a couple of seconds. Activated charcoal has gained a lot of popularity on the internet for its stunning effects against blackheads. Activated charcoal is regular charcoal that has been treated with a gas in a lab to make it more porous. The porosity basically helps absorbs more impurities from the surroundings. When applied as a facemask, the activated charcoal actively absorbs all the impurities from the skin, clearing away blackheads quickly. To create an effective facemask, mix 2 capsules of activated charcoal with ½ teaspoon of bentonite clay and some water to make a paste of medium consistency. Apply the mask on your skin and let it dry. After a couple of minutes, rinse off the mask using lukewarm water and moisturize afterwards. A few drops of castor oil have the ability to absorb skin impurities that instantly clear out dead skin cells and impurities, unclogging your pores and clearing out blackheads. To get rid of blackheads, simply apply a thin layer of castor oil on your clean face and massage it for a minute or two. Leave the oil on for 15 to 20 minutes. If the oil gets too sticky, you can wipe off the excess moisture using a piece of cloth or a cotton ball. Aloe Vera has soothing properties that controls excess oil production, preventing blackheads. This in turn helps get rid of blackheads, acne and other skin problems. All you need is a fresh leaf of aloe vera. Carefully extract the gel from the leaf and apply it on to your face. Leave the gel on for about 10 minutes and rinse it off using lukewarm water. Fenugreek is a powerful plant that is rich in anti-oxidants and has powerful anti-inflammatory properties. Whether you opt for topical application or oral consumption, fenugreek leaves are highly effective at clearing out blackheads from your skin. Simply grind the leaves with adequate amounts of water to create a thick paste. Apply the thin layer on to the affected area and let it rest for about 10 minutes. Rinse it off using lukewarm water. Do not forget to moisturize afterwards. Turmeric powder is an excellent antioxidant and contains several anti-inflammatory properties. While the spice can be used for creating delicious curries, it is also effective for getting rid of blackheads. Simply mix a small amount of turmeric powder along with some coconut oil and water to form a paste. Use the mixture to dab onto your blemishes and let it soak for 10 to 15 minutes. Use lukewarm water to rinse it off. 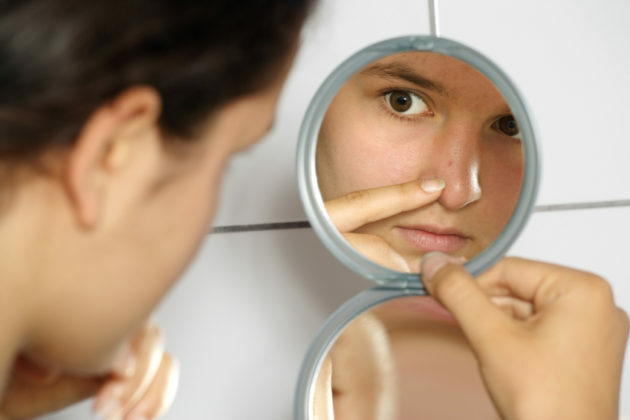 Use this remedy daily to get rid of stubborn blackheads and prevent them in the future. Aside from a delicious snack, oatmeal can also be used as a facemask as it removes dead skin cells, soothes irritation and soaks up excess oils, resulting in a clearer complexion. For this remedy, simply cook enough oatmeal in distilled water to make a facemask or simply cover your blackheads. Allow the oatmeal to cool at room temperature and then apply it on the affected area or on your entire face. Leave it on for about 10-15 minutes and then rinse it off using lukewarm water. Use this remedy at once a day until your blackheads start to disappear. Be sure to moisturize your skin afterwards. Cinnamon is a highly anti-bacterial spice that can be used for making aromatic face masks. It is highly active at removing blackheads. For this remedy, mix one part cinnamon with two parts raw honey to form a paste. Use a brush to apply a thin layer on the affected area. Leave it on for at least 15 minutes. You can wash off the paste with lukewarm water or your favorite cleanser. Do not forget to follow up with a moisturizer. Lemon juice is rich in citric acid which naturally removes dead skin cells, making it the perfect solution to clogged pores and oily skin. Additionally, the vitamin C stimulates collagen production and improves skin health. Lemon juice also reduces scarring from acne. For this remedy, start by washing your face using a natural cleanser and then squeeze about 1 teaspoon of fresh lemon juice into a small bowl. Use a small cotton ball to apply the juice onto the affected area. Make sure not to dab or damage the skin by applying too much pressure or rubbing it excessively. Allow the lemon juice to dry for at least 10 minutes and then rinse it off with cold water. Honey is an effective solution for getting rid of blackheads, especially those which as acne related as it is both antibacterial and antiseptic. For this remedy, simply heat about a tablespoon of pure raw honey and wait until it is warm to the touch. It is easier if you place a small jar in a pan of hot water. Dab the warm honey onto the blackheads and let it sit for 10 minutes. Use a warm, damp cloth to wipe it off. You may also leave the honey onto your skin overnight however it is best you test a small patch to ensure you are not allergic to the ingredient. Antioxidants and vitamins in green tea can effectively help get rid of excess oil and reduce inflammation. Steep two bags in some water and allow it to set for about one hour. Pour the liquid into a ceramic bowl and allow it to cool off. Use a cotton ball to dab the liquid onto your blackheads. Rinse it off with cool water and do not forget to moisturize. These are just a few easy and simple home remedies that will help you get rid of blackheads using ordinary kitchen ingredients. For best results, adopt a healthy skin care regimen that including cleansing, toning and moisturizing. Additionally, invest in high quality products. You will surely be surprised by the results. Good luck!